From Goodreads ~ A bitter divorce is only the beginning. First the father hires thugs to kidnap his son. Then the mother hires Spenser to get the boy back. But as soon as Spenser senses the lay of the land, he decides to do some kidnapping of his own. With a contract out on his life, he heads for the Maine woods, determined to give a puny 15-year-old a crash course in survival and to beat his dangerous opponents at their own brutal game. Spenser is a private detective in Boston and has been hired to protect Paul, a fifteen-year-old, who is in the middle of a custody battle between his parents, Patty and Mel. Neither parent really wants him but neither wants to let the other parent have him. To protect Paul, Spenser takes him in and helps him mature by teaching him boxing, exercise and weight-lifting and together they build a cabin. In the meantime, Spenser has to figure out how to get Paul's parents to back off and leave Paul alone so he can figure out what kind of life he wants. 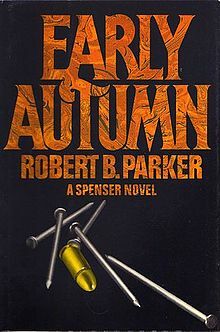 This is the seventh in the Spenser series (there are currently 46, with the last six written by Ace Atkins after Parker's death in 2010). I've read many over the years (and have enjoyed the series) and have started reading them from the beginning of the series. Though it is part of a series, it works as a stand alone. I liked the writing style ... I find it humorous at times. Spenser is a tough guy with a wisecracking sense of humour. Though this book was written and is set in 1980, it didn't seem as dated as the earlier ones. It's written in first person perspective in Spenser's voice. As a head's up, there is swearing.